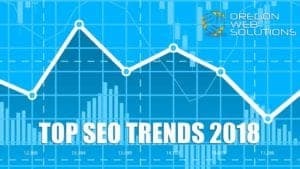 What Are Some Of The Top SEO Trends for 2018? Staying on top of the changing trends in search engine optimization (SEO) is a must if a website is going to be seen by targeted customers. In fact, using outdated techniques can result in penalties that drag down listings in the search engine results pages (SERPS) of Google. To avoid getting penalized and ensure that a website is fully optimized, these top SEO trends for 2018 should be considered. In 2018, building valuable backlinks will still a critical factor for ranking in the SERPS. This is one of the major ways that Google knows that a website can be trusted. Quality should be used over quantity when backlinks are created. It's better to have one link from a highly trusted website than it is to have multiple links from directories. Another important factor to consider is backlinks that come from unassociated sites. Some competitors will create poor links from un-trusted sites and send them to their competitors. They do this in hopes of penalizing their competitors and dropping their rank. A good search engine optimization specialist understands how to disavow these type of links so that a website does not have rankings dropped. Strengthening the brand of a business is also one of the top SEO trends for 2018. When a brand is listed and recognized in the top SERPS, customers are more likely to purchase their products or services. A top brand is also more likely to collaborate with other organizations in their industry or niche. Social media sites are free and should be utilized to heighten the brand awareness of a business. While social media sites are not typically used in the decision-making of ranking, they do provide another avenue for traffic. Videos and images are more likely to get shared on social media sites and that helps potential consumers recognize a brand. In 2016, Google began to roll out their Quick Answers feature. These are small snippets of information that Google highlights at the top of their SERPS. A user does not have to open the link to see the content that is contained on a webpage. Instead, Google extracts a summary answer from the webpage and features it in a block of text. Over time, the answer that is given may change as Google is continuously working on providing a user with the best results that are possible. One of the top SEO trends is optimizing a site to hopefully have the content get featured. This can be done by optimizing off-page as well as on-page content. Often, lists are highlighted in the Quick Answers section. By creating a list of solutions to answer a question, optimizing the page with valuable incoming links and making sure that the page is also optimized for mobile users, a webpage has a higher chance of appearing in this prime location on the SERPS. Leveraging voice search is another one of the top SEO trends that will be affecting search engine optimization in 2018. Many users are now speaking into their devices instead of taking the time to type out questions. It's much faster, it's more convenient, and it's catching on fast! In fact, studies indicate that if the current growth of voice search sustains its pace at the same rate that in three years, close to 50 percent of the searches performed on the internet will be via speech or by clicking on images. Smartphone use has skyrocketed in the past few years. This has increased the use of mobile search at the same rate. Traffic that used to flow to desktop computers is now starting to flow to mobile devices. In fact, since early 2015, mobile searches on Google's SERPS have been higher than searches from desktop computers. This makes mobile optimization a top priority for search engine optimization 2018. Google already announced that they are experimenting with mobile-first indexing, which shows that it's one of the most important SEO trends that they are serious about prioritizing. While Google still favors the desktop point of view for its search index, it's probably a good time to start optimizing for mobile too. If a website has not already been changed to look great on a mobile device, it's time to start. Google is recommending that a site should have a responsive template or theme. Mobile friendly websites are able to be easily seen on mobile phones, tablets or desktops. E-commerce platform should also be updated so that products or services can be easily scrolled through. 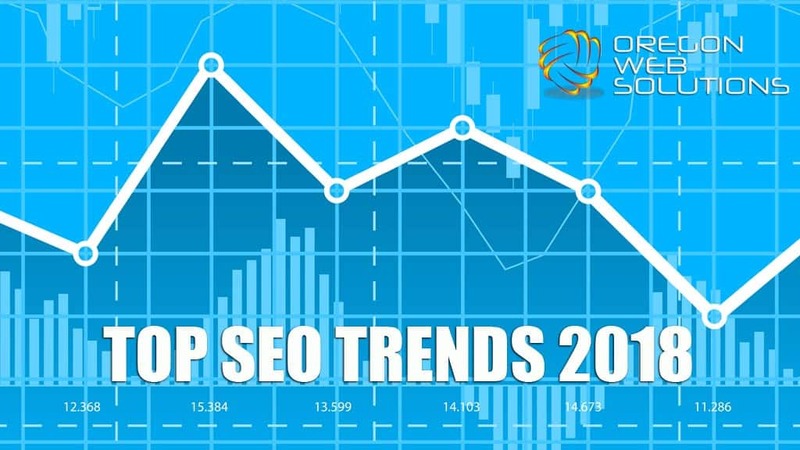 By paying attention to these top SEO trends and implementing specific strategies, it will ensure that a website is fully optimized and ready to receive targeted customers. What Are Some Of The Top SEO Trends for 2018? Overall rating:	5	out of 5 based on 48	reviews. © Copyright - Oregon Web Solutions. All Rights Reserved. Not For Reproduction Use.